Physical Rehabilitation for animals is growing throughout the United States. Physical Therapy is a 100 year old human based profession focused on clinical rehabilitation supported by scientific research that addresses neuromuscular-skeletal movement deficits with a goal of returning function after a surgery, disease or injury. 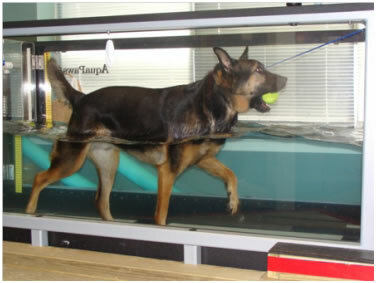 Now, what has been known to work in human medicine, physical therapy is being utilized in the rehabilitation of animals. Physical Rehabilitation Therapists take a systematic approach when assessing the movement deficits (problems) of the patient. 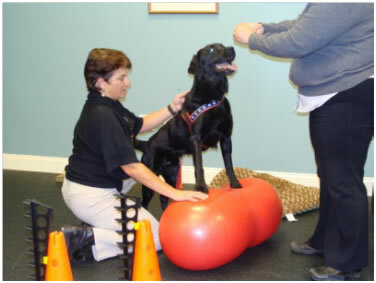 By assessing the entire animal, your Physical Rehabilitation Therapist can identify both limitations caused by the primary injury as well as areas of motion restrictions that can be improved. Physical Rehabilitation Therapists are concerned with mechanics of functional movement. Osteoarthritis (O.A. ), Weight reduction and management to aide in the treatment of O.A. Many more problems with cats, alpacas, and other mammals. Providing your pet with Physical Rehabilitation is your animal’s best chance for a speedy recovery to full mobility after disease, injury or surgery. The sooner an animal is evaluated and prescribed a rehabilitation treatment plan, the better and faster the recovery to optimal results. You, the animal’s owner, play a major part of the recovery effort. A Physical Rehabilitation Therapist assesses the injured area. This functional assessment, including damaged tissue identification, is conducted during the initial evaluation. The Physical Rehabilitation Therapist will assess the effect of an injury on the functional mobility of the entire animal. Measurements of muscle mass and joint mobility are usually completed at the initial appointment. These measurements will give the therapist a baseline to start from. Once the Physical Rehabilitation Therapist has assessed the pet’s mobility and determined the nature and extent of the damage, the initial evaluation is complete. Next, they will develop a treatment plan. The Physical Rehabilitation Therapist’s findings in conjunction with the veterinarian’s diagnosis allows the creation of a specific rehabilitation plan for each patient based on their specific issues, strength, age and the goals of their owner. For the house pet, the goals of physical rehabilitation might be to simply be able to go for a walk or get around the house. For a working or athletic animal, a return to high strength or skilled performance might be the ultimate goal. • Range of Motion: Can the joint(s) in question be moved through all its possible directions, to the normal limits, without pain or internal restriction? “Actively” meaning the therapist observes the available joint motion independently at movement activities such as walking. Then range of motion is assessed “Passively” meaning the Physical Rehabilitation Therapist will move the joint(s) without the animals’ muscles contributing to the motion. Any restrictions in these two measurements versus what should be available for a healthy animal is an area of treatment focus. • Strength: Question: Do the muscles surrounding a joint have the power to move within the full range of motion, with enough energy to reach the established treatment goals? If not, the animal will often be put on an exercise program to build up its muscle mass, strength and endurance. This will typically happen gradually over weeks or months to regain its ability to function. This is where the “art” of Physical Rehabilitation meets the science, as too much strength training too soon may cause pain and an unwanted set back. • Restoring full weight bearing of a limb, balance and functional mobility are all critical parameters for your animal’s optimal recovery. If the injury compromises the animal’s ability to stand and mobility, the animal is likely to re-injure itself and not progress. Muscle balancing means that the opposing and surrounding muscle groups on either side of a specific joint maintain length, tension and appropriate strength. If one muscle group is too strong or tight, over time this imbalance pulls a joint out of alignment to cause joint damage. Stretching the side that is too strong, and strengthening the side that is too weak or tight will be a major part of the treatment plan for the subject animal. Modalities: When you visit a Physical Rehabilitation Therapist you may hear the term “modalities”. 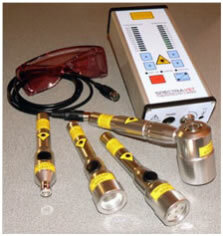 This simply refers to the use of technologies such as laser, therapeutic ultrasound, electrical stimulation, etc. that improve the healing process to restore pain-free functional movement. 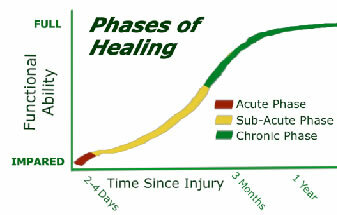 In the healing phases of acute and sub-acute, modalities are focused on reducing pain and the inflammatory response. Reducing inflammation and pain early in the recovery is critical to Rehabilitation. 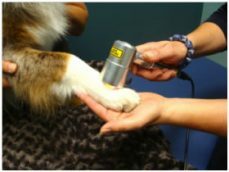 Pain reduction can be achieved from something as simple as a cold pack, to therapeutic laser use or medications prescribed by the veterinarian. Reducing the pain level is an important first step in the process of recovery. Modalities such as Therapeutic Ultrasound, provide multiple benefits including tissue extensibility while reducing pain and promoting healing. The Physical Rehabilitation Therapist helps the animal regain flexibility, balance, and strength to restore coordinated functional movement. Modalities for this phase of the recovery include items like “wobble boards” for balance, therapy balls and Theraband™ for core strength. The use of an underwater treadmill is ideal for building strength, flexibility and endurance in a low weight bearing environment that restores functional, pain free movement. Pet owners have a variety of choices for treatment of their animal’s injuries. Alternative interventions such as massage, chiropractic, and acupuncture are highly beneficial, especially when combined with Physical Rehabilitation. Massage can reduce muscle spasms, chiropractic can restore joint alignment and movement and acupuncture can reduce pain. If the rehabilitation plan does not address all the involved systems; bone, ligament, tendon, muscle, and cartilage, the animal will not achieve long-term recovery of functional motion. Physical Rehabilitation addresses all of these systems for the best long term recovery of movement dysfunction secondary to injury and disease. 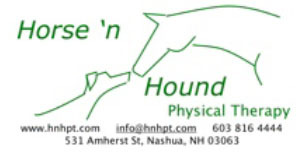 Taking a proactive approach to injury recovery is the best option for your animal’s restored functional movement. Combined efforts of your Veterinarian, Physical Rehabilitation Therapist, and other medical service providers can establish a set of recovery goals and a treatment plan that enables your animal to get back on its feet faster, and stay there over time. • Ligaments are soft tissues, yet are very strong bands that maintain the bone to bone connection. While able to flex in a side to side motion, ligaments are not elastic, meaning then do not easily extend in length. Often injuries to ligaments include sprains or can be complete. 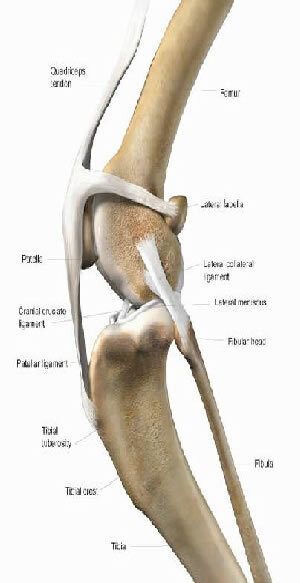 A partial ligament tear can benefit from Physical Rehabilitation, to reduce healing time and restore joint movement. Tearing a ligament and a small bit of adjacent bone, are called avulsions. An avulsion requires surgery to re-attach the ligament to the bone where it was detached. While this re-attachment site is healing (weeks to months) Physical Rehabilitation can help maintain joint mobility. After the tear site has healed, Physical Rehabilitation is beneficial for recovering strength and functional movement. A sprained ligament is stretched, therefore joint integrity is compromised, contributing to Osteoarthritis and often future repeated sprains. Physical Rehabilitation can help restore strength and mobility after a ligament injury (tear or stretch) by promoting a strong muscle system surrounding the joint, improve joint mobility after immobilization, as well as safe movement training, to protect the ligament from further injury or re-injury. A safe movement example would be to not allow a dog with a carpal injury to jump down out of the car or off the bed. • Tendons: Much like ligaments, tendons are strong soft tissue that connects muscles to bone. Because the tendons move over bony prominences or through other soft tissue structures, they can easily become irritated with over use. This injury is called Tendonitis and is a common injury the Physical Rehabilitation Therapist can help your animal recover from. In severe cases, tendons can be torn from either the muscle or bony end of their connection. A full tear requires surgical repair before the recovery process can begin. Therapeutic ultrasound is a common beneficial modality that can reduce the inflammation from tendonitis and promote faster healing. •Muscles are the active part of the mammalian movement system. Muscles function is to contract and relax for active movement of limbs. Neurological balance of muscles on opposing sides of a joint is required to allow for full movement of joints and limbs. The normal range of motion (ROM) of a joint is limited by the joint’s ligaments, the joint capsule and surrounding muscle length. Muscles can be damaged by diseases, impact or overuse. Muscle contraction is controlled by nerves from the animal’s central nervous system consisting of brain and spinal cord. If a joint or structure attached to a muscle is injured, the pain from the injury will inhibit adjacent muscle contraction and motion to reduce further damage to the injury site. This inhibition is neurologically automated and explains why a damaged structure often has muscle spasms, reduced strength, and poor coordination and muscle atrophy soon to follow. • Joints are the mobile connections systems between bones. Each joint has a range of motion which is determined by soft tissue limitations. The movement and power around each joint is determined by the adjacent muscle system. Some joints, like wrists, elbows and shoulders have many “degrees of freedom”; meaning they can move in lots of different directions by design. Others like the knee joint move mostly in one specific two-dimensional path or arc of motion. When damaged, or immobilized for joint healing, the muscles powering a joint can atrophy, loosing muscle mass and strength. As part of the healing and maintenance processes, an animal’s body is constantly producing protein collagen fibers. If these fine strands are not broken by normal movement, they can result in undesired “adhesions”. In the healthy joint any adhesions that grow in the wrong directions are very small and simply broken and re-absorbed during normal movement, without any conscious awareness of pain for the animal. However, if a joint is immobilized for a long time period due to injury or surgery, adhesions grow in all directions restricting proper movement of a joint. This adhesion generation process is known as contracture. 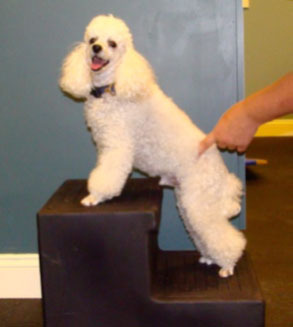 In the case of permanent functional loss, the owner might wish to consider a Physical Rehabilitation Therapist’s aid in teaching the animal compensation methods of movement and function, and possibly fitting a wheelchair or other adaptive splinting device to provide the animal with as much movement as possible. The adaptive equipment supports the animal to maintain its mental well-being, functional mobility, and cardiac health to the fullest extent possible. • Cartilage is the friction reduction and shock absorption materials of mammalian joints. Attached to the ends of bones and between two or more bones these materials promote pain-free, smooth movement within a joint. If cartilage is damaged this can lead to “Arthritis” which means the ends of the bones have worn down the cartilage leading to an inflamed, swollen and painful joint with restricted movement. Major damage to these surfaces and tissues can eventually result in chronic pain, reduced range of motion and function requiring medication, Physical Rehabilitation, or surgical intervention involving a partial or full joint replacement.